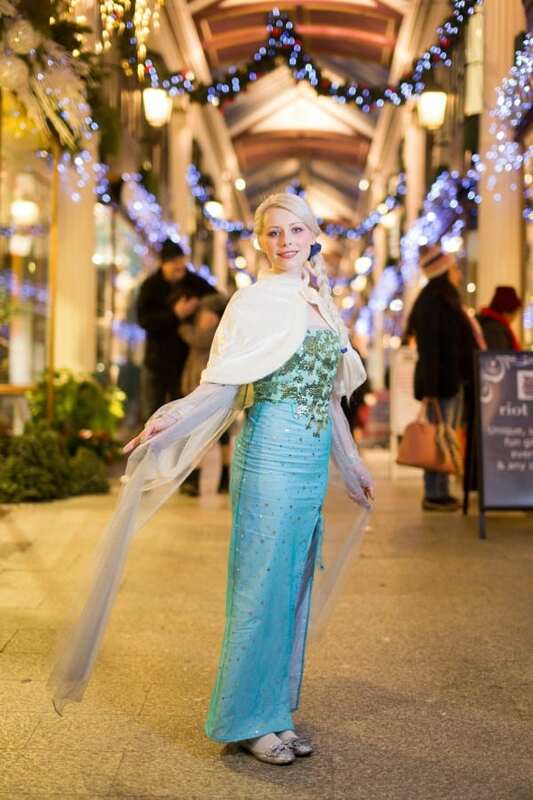 A shop assistant at a John Lewis children’s section has become Frozen Princess Elsa lookalike – after getting pestered by young fans at work. 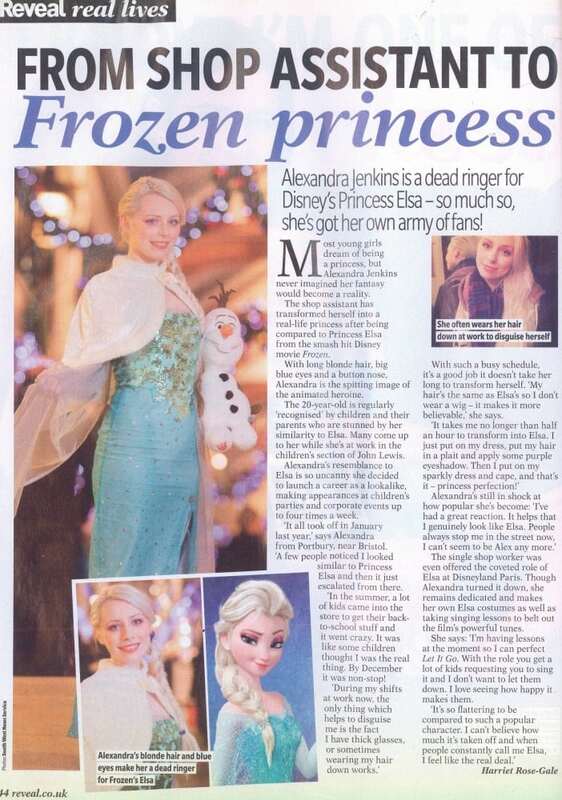 Pretty Alexandra Jenkins, 20, was constantly ‘recognised’ by children and their parents who noticed her uncanny resemblance to the popular Disney Princess, Frozen Princess Elsa. The only way to disguise herself at work is to wear thick spectacles – much like Clark Kent in Superman. 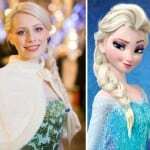 But now she has taken on a second career as an Elsa lookalike, appearing at children’s parties and corporate events. She said: “It all kind of took of in January last year really. I was told by a lot of people I looked similar to Elsa and then it just kind of escalated from there. “By the start of December I was getting told I looked like Elsa all the time; I get parents come up to me all the time telling me I look like Elsa, as well as the kids. “At work the only thing which is able to disguise me is the fact I have glasses, or sometimes wearing my hear down works. “If I don’t wear my glasses, or even when I do sometimes, the likelihood is I get a lot of people coming up to me telling me I look like Elsa. “Over the summer lots of kids come in to get their back to school stuff and they tell me I look like Elsa, or their parents start pointing me out.” Alexandra, of Portbury near Bristol, has worked in the children’s clothes section in John Lewis at Cribbs Causeway, Bristol, for almost three years. But her blonde plait and poignant face shape means it only takes her half an hour to transform herself into the famous Princess after work or at weekends. Alexandra says she now in popular demand and is constantly asked to do children’s parties as well as corporate events. She added: “I’ve had a great reaction. People are always asking me if I do events or parties. It helps that I genuinely look like her. People stop me in the street quite a lot. Single Alexandra – who was offered the role of Elsa at Disneyland Paris, but turned it down – is now booked for around four appearances a week. She has even taken up singing lessons to perfect the voice of the popular film character. “I’m having singing lessons at the moment so that I can perfect ‘Let it Go’,” she said. “With the role you get quite a lot of kids asking you to sing it, I don’t want to let myself down. It also really helps you to get into character, blasting it out. We helped Alexandra share her story with Reveal Magazine as an exclusive (Reveal bid the most for the publishing rights to Alexandra’s story). If you have a fun, heartwarming or lighthearted true story you’d like to share with the press, please get in touch today. We’d love to hear from you. Simply complete the two minute valuation form on the right hand side of this page and we’ll get back to you with a valuation. All messages are confidential and we won’t print anything without your express permission. 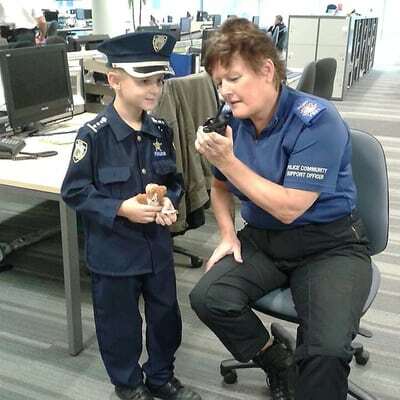 Little Callam told how he wants to be a policeman when he grows up and asked if he could visit a station and “try on some handcuffs pleas (sic)”. To avoid disappointment his proud mum Kerry, 39, warned him that he might not be allowed into the station as he is so young. 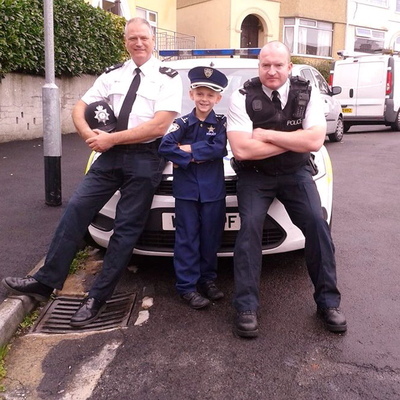 So the youngster was stunned when two officers knocked on his door with a mobile CCTV van and allowed him to have a look round. Just when he thought it couldn’t get any better, he was invited to New Bridewell Police Station in Bristol for a guided tour. The aspiring police officer was picked up from his home and taken to the station in a patrol car with the lights and sirens on. Once there, he was allowed to try on the riot gear, as well as a pair of handcuffs, and talk to police officers about their day-to-day duties. Mum Kerry said: “When two officers came to the house it blew him away. “We hoped they would write back to us but we didn’t think he would get the amazing experience he did. “They had a mobile speed camera van with them and they let Callam get inside. I think in all honesty he would have been happy enough just with that – he really enjoyed it. “They were so impressed with his letter that they invited him to come along to the station and have a look around. “He was so taken back by it. He’s always been very interested in the police. If ever we drive past a car he’ll point it out and he’ll always wave at officers. “But he’s always been a shy lad and has never quite been brave enough to go and talk to a police officer.” Callam wrote the letter on September 22, spending an hour hand crafting it, complete with illustrations of a police badge and car. 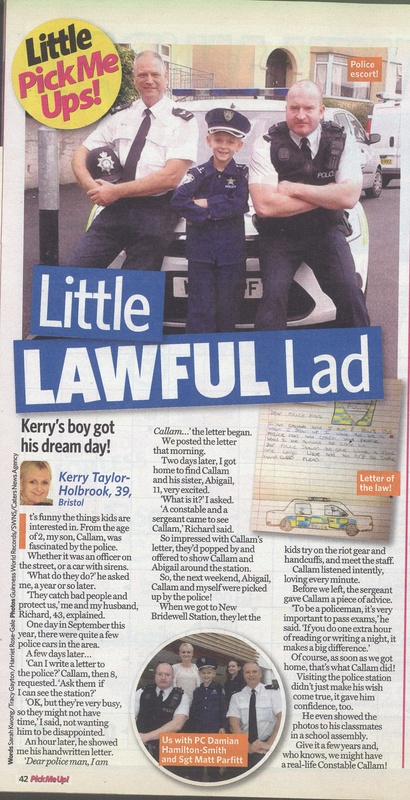 The letter said: “Dear Police man, I am Callam and I am 8 [he got his age wrong] years old. When I grow up I want to be a police man and catch bad people. “Wood I be allowed to come to yor police sttion to see what a real one looks like and try on some handcuffs pleas.” (sic) To his amazement officers turned up on his doorstep just two days later, with a mobile CCTV unit which they let him look around. 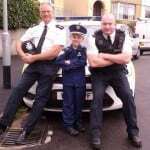 They then offered him a guided tour of their police station, with his mum and sister, Abigail, 11, on Saturday (4/10). Kerry added: “When he got there he was allowed to see all of their equipment. He was taken to the stock room and he was allowed to try on their riot gear. “He got to try on everything he could, shields, helmets and the handcuffs. “They also talked to him about their day to day duties. It’s amazing how much he took in. He’s still excited about it now. Bristol Crocodile on the Loose? Is Chris the Bristol Crocodile on the loose? Police officers were today (Tuesday) hunting a ‘dangerous predator’ after they received a second sighting – of a six foot Bristol CROCODILE on the loose. 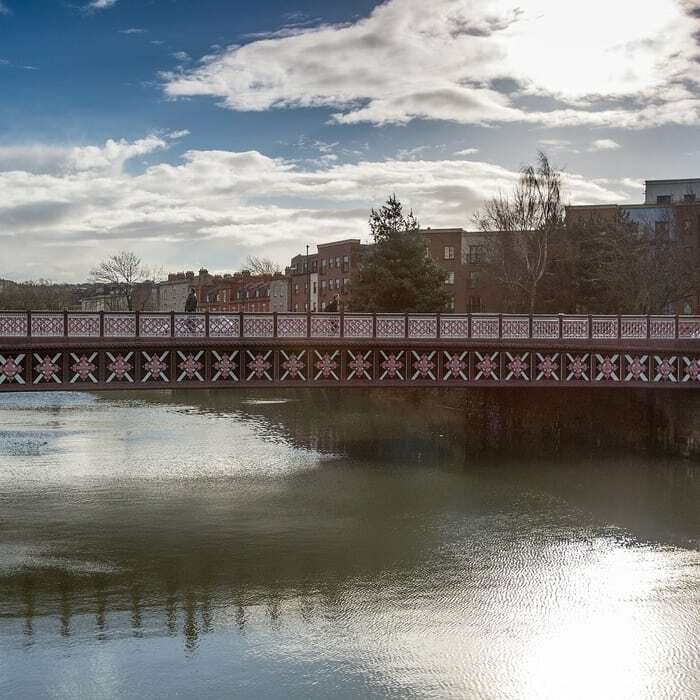 Avon and Somerset police began a search on Monday after a bus driver flagged down an officer claiming to have spotted the large reptile under a bridge. Officers searched for the animal but were unable to find any trace of the predator under Coronation Bridge, Bristol. 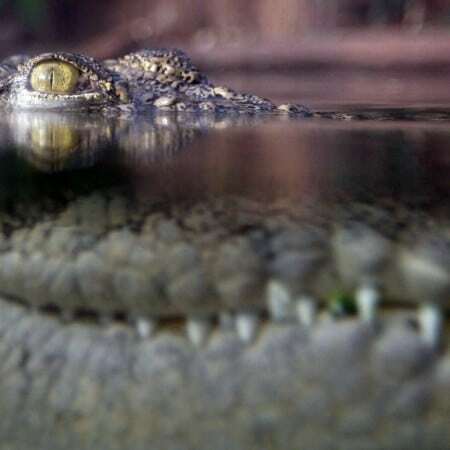 The police quickly established that Bristol Zoo, which is two miles away from where the ‘croc’ was spotted, was not missing any animals. To add to the growing interest in the Bristol Crocodile, twitter profile under the name of Chris the Bristol Crocodile has been opened, boasting about Chris’ antics and giving the police and public the run-around (Chris the Croc @TheBristolCroc). If you come into contact with Chris the Croc, please call the newsdesk (after you’ve called the police). One of our reporters will hot-foot it down to the scene from our Bristol Headquarters.